The above photo was taken in a small fishing town in Japan called Obama, at a training monastery known as Hosshinji. It was taken on this day in 2007. It is a photo of my ordination into the Zen priesthood, the day on which I became a nun after some 20 years of lay Zen practice. I can hardly believe that it has been 11 years since that day. The teacher in the huge, fancy hat is Sekkei Harada Roshi, the Abbot of Hosshinji and a well respected, high ranking member of the Soto Zen establishment in Japan. I knew nothing about any of that, however. At that time, I only knew that I had met a person whose practice was so deep and so vast that it changed my life. His practice and teaching gave the Dharma a whole new dimension. As I said to my Zen friends in the US after my first five day sitting (sesshin) with Roshi, it was like realizing that my practice had been exploring the four corners of the earth for many years, but now I had been shot off in a rocket. I was exploring something much greater. The vastness was daunting and inspiring all at once. Practice with Harada Roshi surprised me in many ways. Perhaps more importantly, I saw in Roshi's practice the reality that it is possible to awaken to the inner meaning of the Dharma, to the true nature of all being. Over the course of a very short period of time, the Dharma went from theories and concepts to a lived activity framed by the inquiry, "What is this moment?" So what does it mean to be ordained into Soto Zen, particularly when lay practitioners and priests all take the same 16 bodhisattva precepts? When asked by Sojun Mel Weitsman the meaning of being a Zen priest, Shunryu Suzuki Roshi of San Francisco Zen Center famously replied, "I don't know," a reply echoed by his then assistant Katagiri Sensei, who later become the Roshi at Minnesota Zen Meditation Center. I understand this reply to be an elegant pointer toward the basic paradox of Zen - the mind and heart of abiding in and responsiveness in the moment, and the timelessness of a practice that points to the personal discovery of suchness. 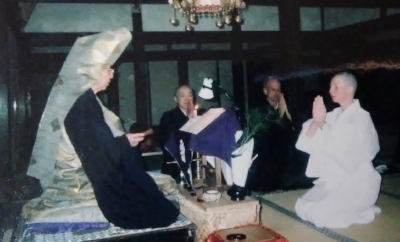 In later writings about the meaning of priesthood, Sojun Roshi would point to "...the fundamental intuitive quality that is the basis of our practice." Yes, being a Zen priest is a life committed to "don't know" mind. Sekkei Harada Roshi too would exhort us, the Hosshinji residents, "You are not from families that expected you to become a Zen priest. Why did you ordain? Don't forget the reason." The reason was to be fully immersed in a life of waking up. And in the course of waking up every day to the world of suffering and freedom, there are many aspects to being a Zen priest. In large part, we are role models, whether we know it or not. We are a visible example of the path of committed practice. We model sitting, model ceremonies, model wisdom and compassion, model ethics, model humility, model friendliness and inclusiveness, and so much more. Of course, sometimes we also model making mistakes and finding ways to correct them or atone for them. This too is the very public practice of a priest. Once, when I told Zenkei Blanche Hartman Roshi that I was planning to sit more often in my room in the evenings, she said, "Don't be so selfish. If you're going to sit, do it in the zendo." Sharing our practice with others, being an upstanding role model for their practice, is an important part of being a Zen priest. Because we have this commitment to living fully in the Dharma and to being a role model, priests also take on the responsibility of serving the sangha. Like being a role model, being of service takes many forms, from the mundane tasks like cleaning toilets and cooking, to the most exalted functions like leading complex ceremonies or teaching from the platform. Often we are of the greatest service to our sangha when sitting quietly over a cup of tea, listening to the heartfelt to and fro of a human life. 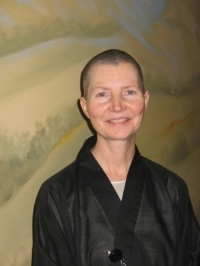 Shosan Victoria Austin has been my Teacher for 13 years, and it is her practice of service to sangha that inspired me to become a resident at San Francisco Zen Center, and to continue as a priest when I returned from Japan. To be of service is to embrace the fullness of a human life, and without Shosan's shining example, I don't know whether I would have ever found the generosity in my heart. These days, the big questions for me as a priest are about how to best serve the sangha and the tradition. How can the practice of Zen be true to its full lineage, all the way back to the historical Buddha? How does one maintain the quite specific forms and teachings of this tradition, and pass them to future generations in ways that are suited to this culture and time? How does one do this delicate, intimate dance of practice together with people with all sorts of expectations and life experiences, and still show them the beauty of a way they have never imagined? The life of this priest has been incredibly varied, and there have been times when the vow of service loomed large. One example is the time that I was in the hospital offering spiritual care on Ash Wednesday. I'd spoken to my supervisors quite a bit about the ritual of offering ashes on the forehead, its meaning, and whether I could actually do such a thing. Then one of my peers, an Episcopalian priest, shared the meaning to which he felt closest. He said that Ash Wednesday is about the circle of life and the inevitability of death - ashes to ashes. This was something I could get behind. Still, I secretly hoped that I would not be called upon to do this little ceremony. The day flew by, and I was about to settle in for the night, when my pager went off. I was asked to visit the acute care floor to offer the ashes to someone who had been asleep all day and missed the floor chaplain. I prepared myself on the way, recalling the words, the ceremony, and what I might say to the patient about its import. As usual, when I arrived at the unit, I asked to see the patient's chart. To my consternation, the patient was a man with whom I had had a difficult interaction just days before. He was a large, older gentleman with debilitating, chronic back pain. When he arrived at my regular unit, I had gone to his room to introduce myself but, seeing my shaved head and Zen clothes, he dismissed me at the doorstep with a roar. Now I was the only person in the hospital who could give him what he wanted. Would he still want the ashes? Would I give them to him? I entered the room quietly, checking to see whether he was awake. It was fairly dark, but I could make out his face as he lay in bed. He turned and saw me, and gently acknowledged his recognition of me from the day of his arrival. I asked whether he wanted to received the ash ritual. He said he did. I placed the ashes on his forehead, in the shape of the cross, speaking the words, "ashes to ashes, dust to dust." At that point I expected him to ask me to leave but, instead, he asked me to stay. In the softest of voices we spoke for some time of the wonder of life, encounters with people and things that are unexpected, and the beauty and mystery of simply being a human being. This man's don't know mind was so present and so gentle. I was deeply moved. A Zen priest never knows where don't know mind will appear. So how does the ancient way become embodied in me and in the sangha, honoring the uniqueness of each person, while engaging the one who can see the emptiness of body and mind? These are the questions of a Zen priest in 21st century America. The answers? Well, I don't know, and I vow to continue not knowing so that, step by step, we practice together and discover the way in each moment.